The freshmen from India will get to play in this tournament as many of the Indian big players will enjoy the holidays at their homes. It is an opportunity for the newer players to make a positive impression and leave mark considering which they would regularly be involved in the international matches and especially for the Champions Trophy 2017. MS Dhoni is leading the team to find out the best out of the selected new squad. Many of the likes of Virat Kohli, Shikhar Dhawan, Ravichandran Ashwin, and some others have given rest following the recently concluded IPL and WT20, and there is going to be very busy schedule as Indian team is having a series with West Indies next month. The newly selected squad of India has five out of 16 players who are yet uncapped. And Dhoni practically has more experience than the other 15 players combines. It will surely have difficulties playing on foreign soil. It is mostly similar to the situation which was there last year when India had a tour of Zimbabwe with a substitute team. Dhoni wasn’t there on the team, and yet India won all the three ODIs. Manish Pandey supported Indian with his excellent innings when he scored 71 in the 3rd ODI at Harare Stadium. Pandey also made his first international ton against Australia earlier this year. Now, he may be playing to become India’s most sought-after batsmen. Dhoni has belief in another player Jasprit Bumrah too. The pace bowler started his bowling spell well in his debut international ODI against Australia in January. However, he is just a single one-day match old. On the other hand, Zimbabwe will play with its full strength team. However, the team is in a transition state with an interim skipper Graeme Cremer and interim coach Makhaya Ntini. It has been a sad time for Zimbabwe in the recent years as it couldn’t make it to the Super 10 stage last year for the T20 World Cup 2016 and just won one game in the 50-over World Cup 2015 tournament. Moreover, it lost its last ODI series aginst Afghanistan with 3-2 in January this year. IND vs ZIM 1st ODI will start at 12:30 pm IST or 3 am EDT. TV Channel: Ten 3 and Ten 1 HD. USA: Willow TV. Zimbabwe: TSM. 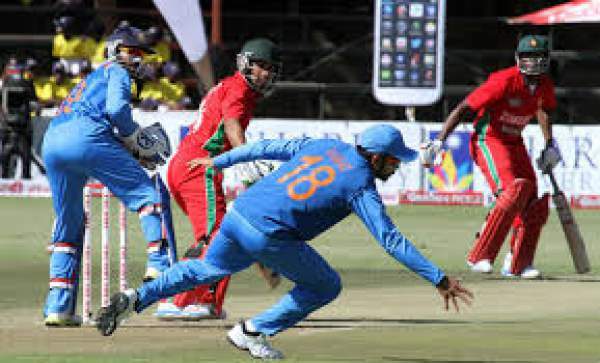 Stay tuned for IND vs ZIM live score, match result, commentary, ball by ball updates, predictions, full highlights, scorecard (scoreboard) and much more.